These peas are believed to have come from an Irish Vegetable research project, although information is sparse and rather vague. I got my seeds via the Heritage Seed Library. 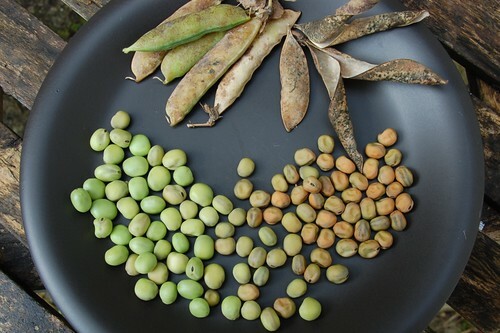 They are quite novel compared to most modern peas, very large seeded, mealy peas that are flat and with a black hilum (the little scar where the pea attaches to the pod) that give them the appearance of small broad beans. They are a little like the Dutch Capucijners although the pods are green and not blue and there are other peas with similar characteristics in collections in the States and Canada. Of course, those were probably taken across with settlers in the past so the history remains cloudy, were the Preans some sort of reselection of an older type or new breeding from old varieties? If anyone knows I'd love to hear from them. The plants are sturdy steady growers, big fleshy plants that will make two metres in height if they're well supported. The flowers are pink and dark red. Rather slow growing, my plants also suffered from mildew during growth although this doesn't seem to have caused them much check. I planted the seeds on 21st April and harvested today. There are still some greeny pods left. Most pods had 5 or 6 peas inside but a few were stuffed with as many as 8. This year I didn't take any for the kitchen as I was growing for seed but the ones I had last year were very good as hearty marrowfats cooked with other vegetables in stews or just eaten raw. 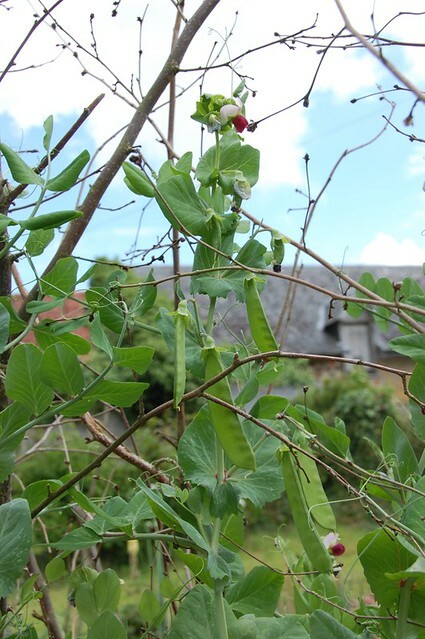 The pods can be eaten as mangetout when young but I think they will do best as a drying pea for the winter. Interesting...I've been meaning to ask someone who knows about marrowfat peas, and I have a sneaking suspicion that you're just the person. Is there a specific variety you grow for this purpose? At first, I thought that Marrowfat was the name of the variety used for the dried version...but then I came to understand that they're are just peas that are dried on the vine/harvested dry. So, now I'm going with the theory that any pea variety that tends to grow large and fat would be best suited for harvesting as marrowfats. Am I on the right track? I love marrowfat peas and ordered several boxes of Batchelors brand from an online UK shop because they are very rare on the ground around here. It would be cool to grow my own next year. Your theory is correct. Marrowfats are the sort of old fashioned big starchy peas that can be dried for winter storage. I'm not sure which variety to recommend for your area or indeed for mine as I tend to dry and use any pea seeds left over in any quantity for the kitchen. However, I think Batchelors do something to their boxed peas, as the colour seems much brighter than most rehydrated and cooked peas I've ever made. They also cook them with bicarbonate of soda which not everybody likes. A quick whisk around UK allotment forums suggests people grow a variety called Maro which is available from Thompson and Morgan over here. Might be worth looking out for that one. Adorei a foto da ervilha e gostei muito do seu blogger.